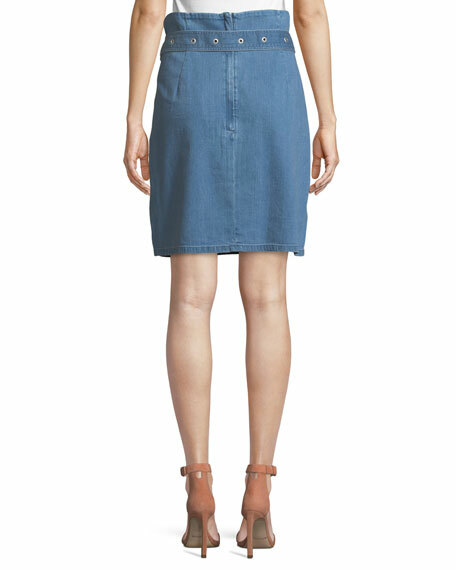 J Brand "Tranquil" denim skirt. High-rise; belted paper bag waist. Carven skirt in cotton. A-line silhouette. Side flap pockets. Mini length. Button/zip fly; belt loops. Viscose lining. Dry clean. Made in Hungary. Model's measurements: Height 5'10.5"/179cm, bust 32"/81cm, waist 25"/64cm, hips 35"/89cm, dress size US 2/4. Flowers By Zoe acid wash denim skirt with distressing. Multicolored tassels down side seams. Button/zip fly; belt loops. Five-pocket style. Flowers By Zoe acid wash denim skirt with distressing. Multicolored tassels down side seams. Button/zip fly; belt loops. Five-pocket style. A-line silhouette. Raw edge hem. Cotton/spandex. Imported. 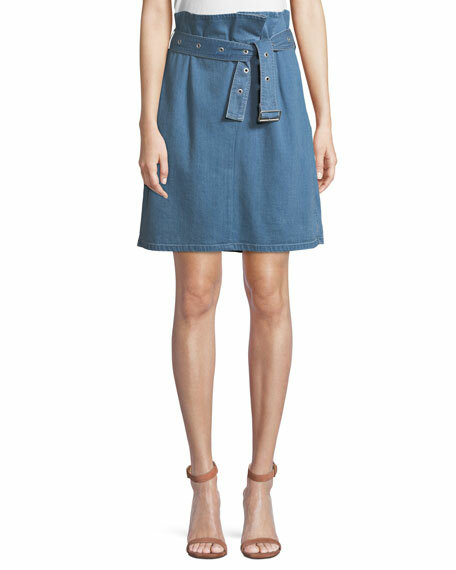 EXCLUSIVELY AT NEIMAN MARCUS FRAME "Le Mini" denim skirt. Mid-rise; belt loops. Button-zip fly. Five-pocket style. Slim silhouette. Notched hem. 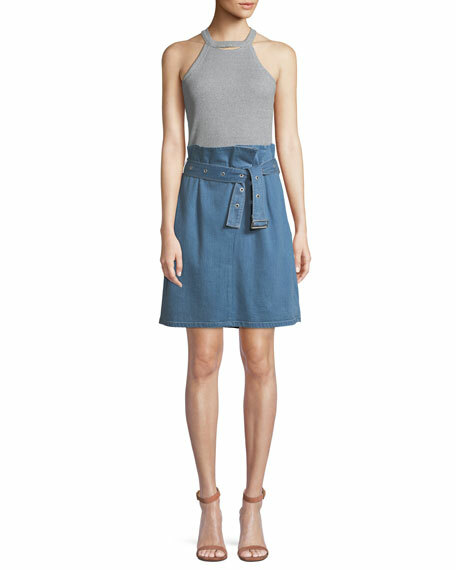 EXCLUSIVELY AT NEIMAN MARCUS FRAME "Le Mini" denim skirt. Mid-rise; belt loops. Button-zip fly. Five-pocket style. Slim silhouette. Notched hem. Mini length. Cotton/polyester/spandex. Made in USA of imported materials. Model's measurements: Height 5'10"/177cm, bust 33"/84cm, waist 25.6"/65.2cm, hips 35.8"/91cm, dress size US 2-4/FR 34-36. FRAME "Le High" mini skirt in distressed denim. High rise; belt loops. Four-pocket style. A-line silhouette. Button/zip fly. Frayed hem. FRAME "Le High" mini skirt in distressed denim. High rise; belt loops. Four-pocket style. A-line silhouette. Button/zip fly. Frayed hem. Mini length. Cotton. Made in USA.